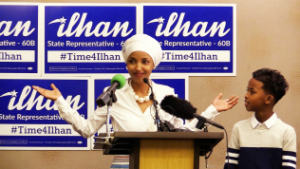 llhan Omar, a young Muslim Somali-American mother of three, challenges the status quo in the highly contested 2016 race for the Minnesota State Legislature. This documentary highlights the campaign of one of America’s brightest rising political stars. Join us for a post-film panel and reception featuring Erin Vilardi, Founder & CEO of VoteRunLead. Community Matters is sponsored by the Westchester Community Foundation. Presented with generous support from the National Endowment for the Arts.